While a smoked salmon version of these smoked trout deviled eggs flew off the platter first, these mini quiche Lorraine were a close second. My cousin made these mini Caprese salad skewers, and my niece brought a gorgeous cheese platter. My goal was to keep everyone filled while dinner was in the oven. Why is it called quiche Lorraine? Evidently quiche Lorraine got its name because quiche originated in the Lorraine region of France. While there are many versions of quiche, this one is the queen of all quiches. How do you make quiche Lorraine? You create a custard of eggs and cream flavored with nutmeg, herbs, and a dash of Tabasco and pour it over sautéed onions, bacon, and Gruyère cheese and bake it in a flaky pie crust. It's delicious. For a full-sized quiche, you will need to par cook the crust before adding the the custard, bacon, onions, and cheese. 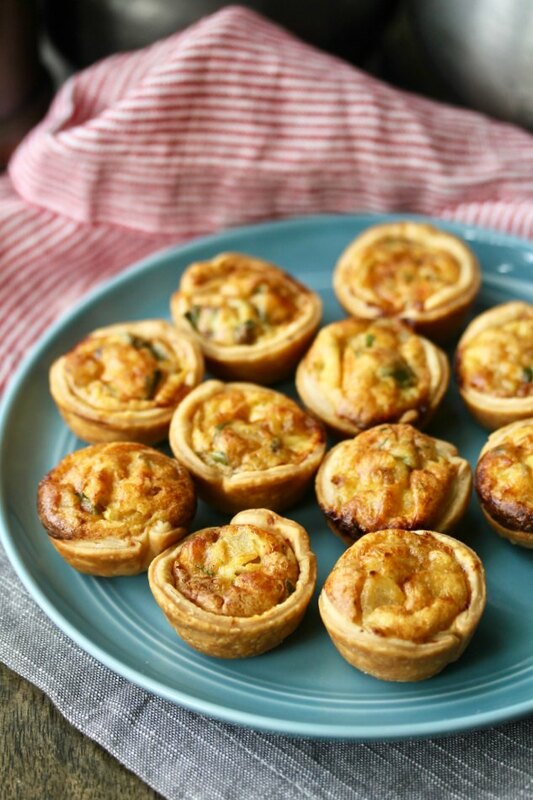 Fortunately, you don't have to when you make mini quiches. What kind of cheese is best for quiche Lorraine? My absolute favorite cheese in the world for baking is Gruyère. It's complex, has a unique crystalline texture, and has a wonderful nutty flavor. It's fabulous on a cheese platter as well as melted in baked goods. It's not cheap, but it's worth every penny. You can also use Swiss cheese (or Emmental cheese) in this quiche. 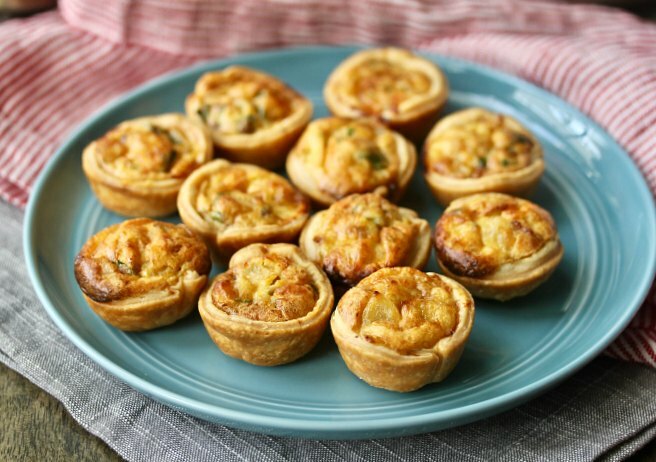 I first posted these mini quiche Lorraine appetizers in October, 2012. This is an update of the post, with new photos and printable recipe card. I love revisiting old beloved recipes and this is one that I've wanted to re-do for a long time. You can use your favorite flaky pie crust. I used refrigerated Pillsbury Pie crust, which I cut with a cookie cutter. It worked perfectly. 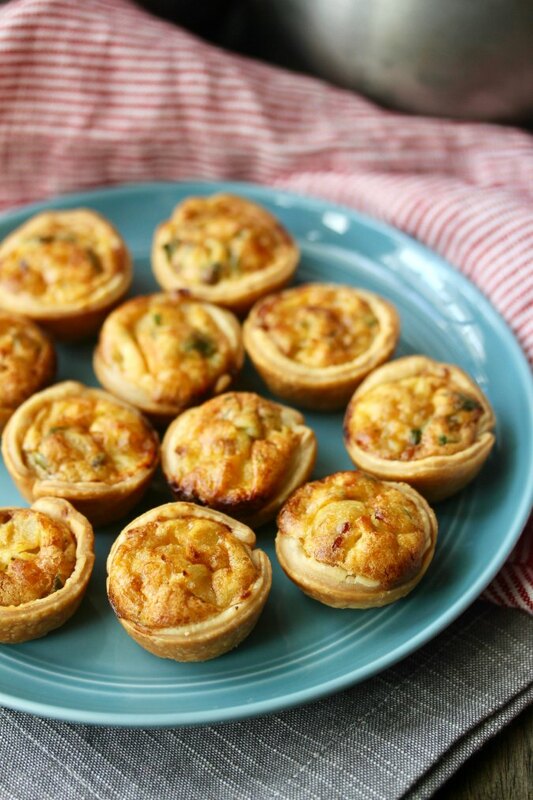 These mini quiches can be made a day or two in advance and frozen or refrigerated. To serve, bring them to room temperature and then reheat in a 350 degree F oven for 10 minutes. Spray the cavities of two mini muffin pans with spray oil, and heat the oven to 350 degrees F.
Cook the bacon in a skillet over medium low heat and drain on paper towels. Reserve 2 tablespoons of the bacon drippings and discard the rest. Cook the onions in the reserved bacon drippings until translucent. Set aside. Beat the eggs in a medium bowl. Add the cream, cheeses, parsley, salt, pepper, and Tabasco. Stir in the cooled sautéed onions. Cut the pastry with a 2 1/2 inch round cookie cutter into 36 rounds. Place the rounds into the muffin pans. Chop the cooked bacon and divide it evenly among the pastry lined muffin cavities. Place about 2 teaspoons of the egg mixture in each muffin cavity. Bake the quiches, one pan at a time, for 30 minutes, until golden and puffy. Small bites are my favorite way to eat! 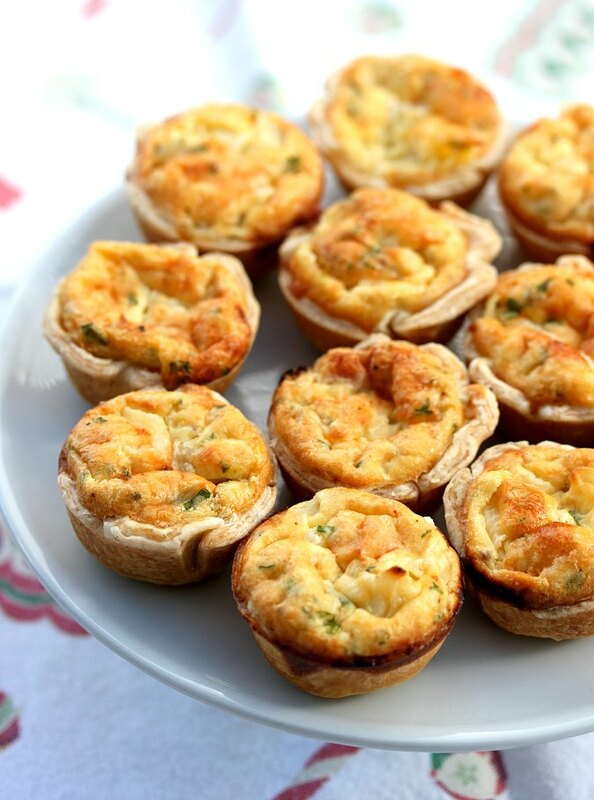 Love these mini quiche, they are perfect for game day appetizers. they are simply perfect! I am now wondering what was all the menu, dinner and dessert.... hummmmm.... I wish I was there! We had three green salads (brought by guests), two kinds of lasagne (which I made), and cookies (brought by guests) for dessert. My nephew also made an amazing focaccia! I love mini quiche appetizers. These look delicious and I'm pinning for later. Such a perfect bite size for a brunch table or breakfast on the go! I've never made mini quiches before...I need to put that on my to-do list! What beautiful bites of brunchy goodness. I can totally see these being a hit at our Easter open house this year! I'm thinking I better make two batches of these - one for me and one for everyone else! I love the cheese choice in these. Thank you! Gruyere is the best. 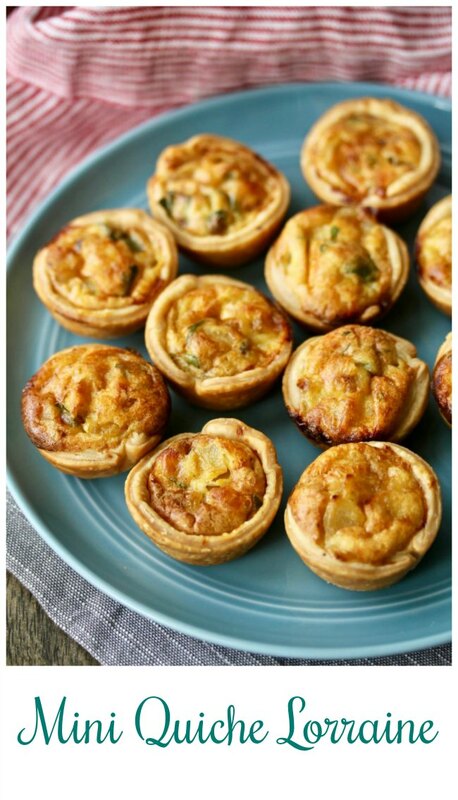 I do love quiche Lorraine, love this idea to make it perfect for a party. Yum! These are the cutest little appetizers, but I'd also make these as a make ahead breakfast to take to work for the week.